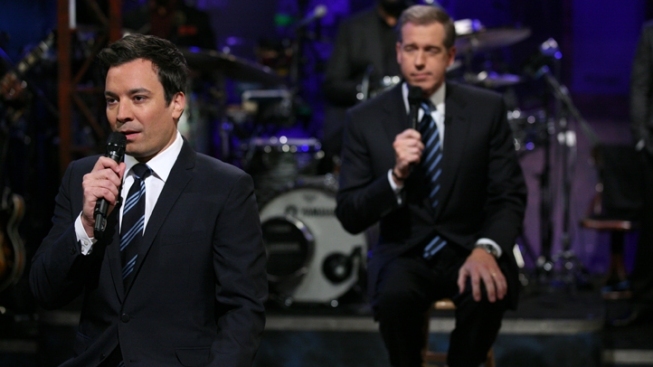 “Sounds like the President goes both ways on this issue,” Fallon crooned. Jimmy Fallon called the Super PACs “super freaky,” and launched into a politically inspired rendition of Rick James’ "Super Freak." “Rock Center’s” Brian Williams joined “Late Night's" Jimmy Fallon on Monday to "slow-jam the news” and jest about President Obama’s decision to get on board with the Super PAC crowd. Fallon later called the Super PACs “super freaky,” and launched into a politically inspired rendition of Rick James’ "Super Freak." Williams — or Bri will.i.ams, as Fallon called him — brought the jam home with an "Oh yeah!"